Prime Roofing have been providing unmatched roofing services in Jacksonville for almost a decade, and our team of contractors understand quite well that choosing a new roof for your home can be an overwhelming experience. If you’re reading this article, chances are you’re seriously considering getting a metal roof. But what exactly do you know about metal roofing, except for the fact that it’s… well, metal?Exactly. You probably don’t know a lot. And that is perfectly understandable. 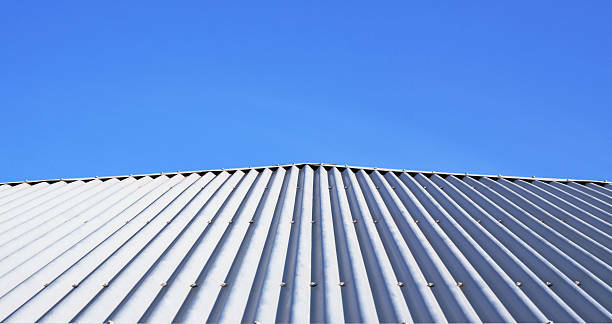 If everyone were an expert on metal roofing, we’d be out of business in no time, right?All jokes aside, we’d like to help you understand what you’re getting yourself into if you opt for metal roofing. That’s why we’ll use this article to tell you about the five types of metal roofs that are the most common choices of our customers. We’ve decided to start our list with one of the oldest types of metal panels in the roofing industry. 5V owes its popularity to its low maintenance qualities and incredible ease of installation. In addition to that, these roofing panels are unbelievably lightweight and highly reflective. As such, they’re a great choice for a typical Floridian home. As we’ve mentioned, 5V panels are extremely popular, mainly because they’re very easy to install. Namely, it’s as simple as fastening single screws with rubber washers at uniform intervals through the top of the lower profile ribs. In addition to that, screws also go along the eve, ridgeline, and the valley. Another fun feature that certainly makes 5V an attractive roofing choice is the fact that it comes in a variety of different colors. Although that is a great option to keep in mind, we must note that the colors do tend to fade over the years. It’s important to keep in mind the constant exposure to the Florida sun, although the panels themselves will not become weaker if the color fades. Still, just to be on the safe side, we recommend going for the natural galvalume finish that is silver in appearance. With a more classic look, corrugated metal panels have originally been widely used on barns and shacks. However, once the galvanizing technology had taken a full swing in the roofing industry, they have gotten a new look. After undergoing a makeover, corrugated metal panels have found a wider use, this time in covering roofs of both residential and commercial buildings. In fact, people often say that these panels create a classic feel about any type of structure. In addition to that, they seem to go quite well with more modern architectural elements such as fiberglass. The reason why corrugated metal roofing is so popular among customers is the fact that it is resistant to corrosion and highly efficient in terms of energy saving. What’s more, the panels consist of more than ⅓ of recycled steel, so they’re also eco-friendly. Customers who are in search of a cost-effective roofing option often opt for R-panel metal roofs. Seeing as their installation process is incredibly easy, choosing them implies lower costs of labor and disposal. Therefore, the entire roofing project is much cheaper with R-panels. Much like 5V panels, R-panels also come in a variety of colors which can give a more appealing overall look to the roof. However, these panels are often not used on roofs of residential buildings, especially in Florida. Namely, R-panels are not designed for heated structures. Despite the ease of installation, the screws tend to become loose after being exposed to heat. As a result, the roof might start leaking and begin to rust. In addition to that, the paint would start fading after being exposed to the sun. In spite of all the possible disadvantages to using R-panels, many people opt for putting them on their roofs. We’d just like to recommend regular maintenance and repainting whenever necessary. In fact, protective coatings might be a good idea to combat most of the issues with this type of roof. Longevity is certainly a feature that has converted many customers into lifelong fans of metal roofs in general. That same longevity is precisely what makes people go for architectural standing seam as the metal roofing of their choice. It is a paneled system with concealed fasteners. What that means is that the panels have a broad flat area with a leg at each end. These vertical legs actually act as raised seams that hold the roofing structure together. Seeing as they’re incredibly reliable, standing seam panels are often used not only for roofs but also for walls. The former is, of course, more common in residential architecture. Standing seam metal roof manufacturers often provide weather-tight warranties in order to convince potential clients of its reliability. In addition to the protection it offers, this roofing system looks incredibly modern and sleek, yet it allows for great freedom in terms of design. Many homeowners are reluctant to opt for metal roofs because they fear the final outcome. Indeed, some metal roofs may appear too futuristic or too barn-like. Obviously, neither of those two options is a desirable sight in a conventional residential area. However, people who are looking for something more ordinary in appearance should stop to consider metal shingles for a moment. This roofing system has all the benefits of a metal roof while giving any home a traditional look. In addition to not being an eyesore, metal shingles roofs are incredibly easy to install. So easy, in fact, that they are the most common choice of homeowners who are into large-scale DIY projects. The installation process doesn’t even require complicated tools! It’s perfectly understandable if you’re still on the fence about opting for a metal roof. We understand that this article only began scratching the surface when it comes to this topic. Here at Prime Roofing, we care about delivering an unparalleled roofing contractor experience and improving all our customers’ homes. So if you have any questions you’d like us to answer, feel free to ring us up at (904) 530-1446 or via our Contact Us page. We’ll be more than happy to help! A great experience! Adam did a great job and was fast, proficient, and very professional. I highly recommend them!